What is a ‘bespoke‘ WordPress Project? Simply put, a project where we’re doing some custom development for you, and it’s more involved than just a couple of hours of work. Bespoke projects are where you need something unique to your business that can’t be provided by an off-the-shelf WordPress plugin or theme, and is bigger than what’s covered by our going tweaks packages. Some projects can be very simple and take less than a day, some projects can be very large and are completed over several weeks. When we give you a quote for a bespoke project, we include an estimate of the time it will take to complete the project in addition to our fees for completing the work. I’ve been developing projects with WordPress since 2005, which means I have plenty of experience with the technical side of WordPress. Rather than just hacking code into WordPress, we create well-engineered solutions for your website. This means our code is very stable, secure and doesn’t cause problems with other parts of your website. Creating an integration with your website and your CRM, such as passing customer data into your CRM automatically for your sales team to use. As the process for a bespoke project is understandably more complex than a few code tweaks, we follow a simple process to ensure we’re developing something that you really need. 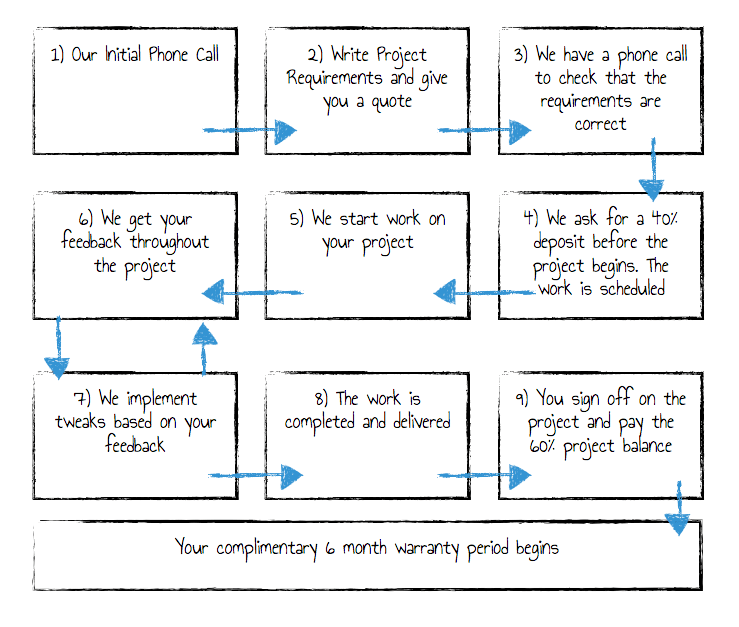 This is the process that we follow when delivering a bespoke project. What do bespoke projects cost? The short answer to this question is ‘it depends‘. This is why we go through the process of gathering your requirements and giving you a bespoke quote. To give you an idea of price ranges, here are some ballpark ranges to help. Please do appreciate these are just guides, and your bespoke quote may be higher or lower than the estimates below. Want to talk about your bespoke project and get a quote? Click the button below to schedule a time to talk.